In 2016, Gross Domestic Product (GDP) for the “North Star State” ranked 17th with over $335 billion and ranked 14th with a per capita GDP of over $53,000. For June 2017, Minnesota had an employed workforce of over 3 million and an unemployment rate of 3.7%. For 2016, Minnesota ranked 27th on the cost of living. 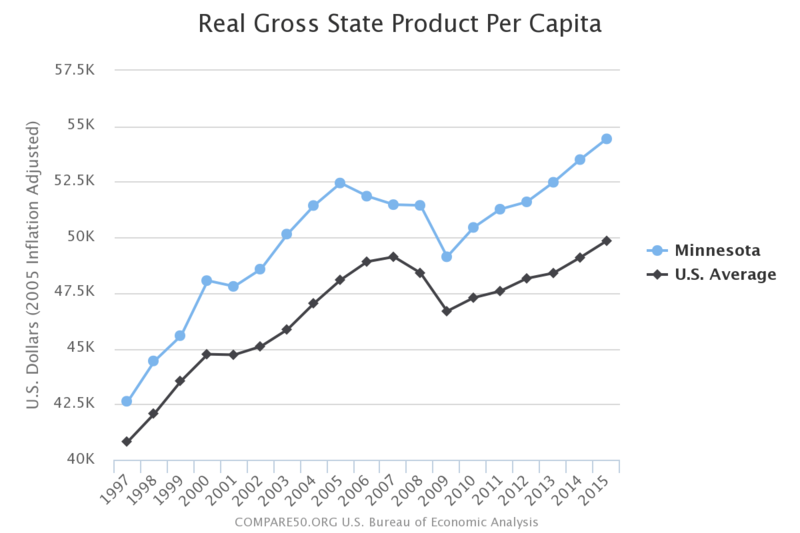 The following shows per capita gross state product for the last 20 years, relative to America at large; Minnesota’s rank on this measure has risen from 14th to 11th. OJT.com connects you with training providers that support all the major Minnesota industries. 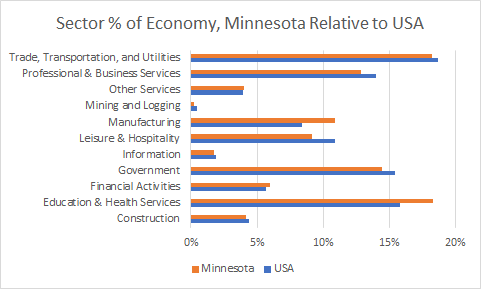 The chart below shows the percentage of the economy, in terms of jobs, that various industry supersectors contribute to the Minnesota economy, relative to the percentage that those sectors contribute to the overall U.S. economy. Minnesota OJT supersectors with a proportionate part of their workforce that is 2% or more than the country at large are the Education & Health Services supersector and the Manufacturing supersector. The manufacturing subsector includes 21 specific manufacturing sectors, which include product manufacturing related to food, beverage, tobacco, textiles, apparel, leather, wood, paper, and printing. Also, petroleum and coal, chemicals, plastics and rubber, nonmetallic minerals, primary metals, fabricated metal, machinery, computers and electronics, electrical equipment, appliances, components, transportation equipment, furniture and miscellaneous. Manufacturing is one of the top supersectors in Minnesota, relative to the nation, with over 320,000 employed (June 2017). Minnesota OJT industries that grew their workforce 2% or more than the country at large are the Mining and Logging supersector, the Construction supersector, and the Information supersector. 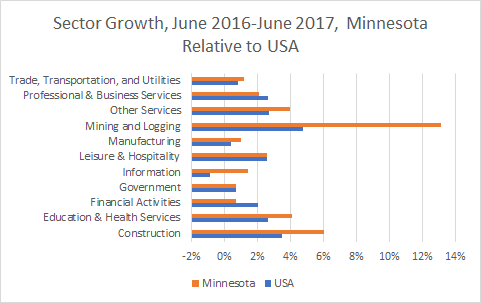 Mining and Logging is the top growth industry in Minnesota, relative to the rest of America, with about 6,900 employed (0.2% of the employed workforce) in this supersector (June 2017). Mining and Logging employment growth between June 1016 and June 2017 grew 13.1% while the national average grew 4.8%. Construction is one of the top growth industries in Minnesota, relative to the rest of America, with about 123,000 employed (4.2% of the employed workforce) in this supersector (June 2017). Construction employment growth between June 1016 and June 2017 grew 6% while the national average grew 3.5%. Information is the/one of the top growth industry/industries in Minnesota, relative to the rest of America, with about 5,700 employed (1.7% of the employed workforce) in this supersector (June 2017). 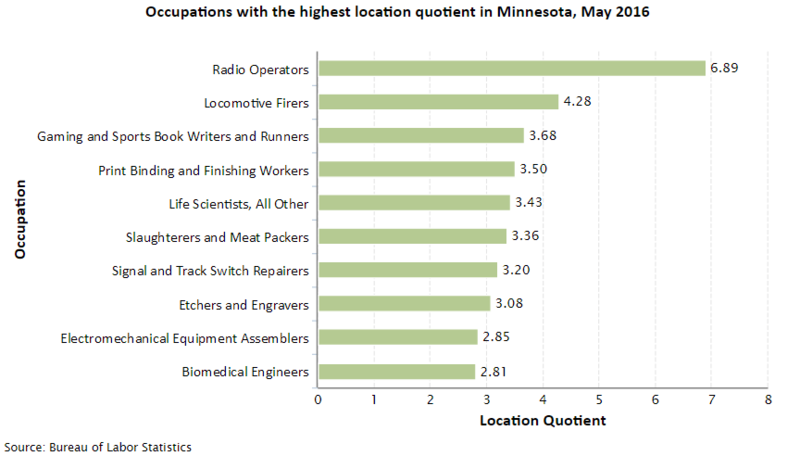 The following shows Minnesota occupations with the largest proportion of employees, relative to the rest of the nation. For example, a location quotient of “5” indicates that the percentage of employees in the occupation is five times greater than for the entire nation. Minnesota has a variety of different training opportunities that you can access on the state government website, see Minnesota Training. 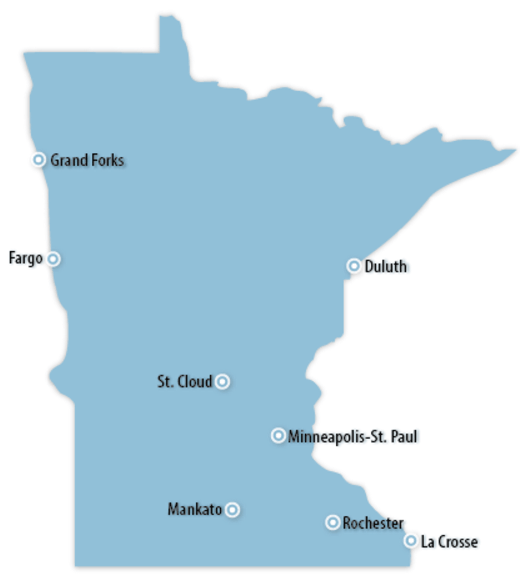 See OJT trainers in Minnesota for additional training providers. At OJT.com, we connect you with the best on-the-job training programs and on-the-job training providers in Minnesota. Whether you are looking for job training manuals, job training videos, on the job training programs, or any other sort of job training programs in Minnesota, OJT.com can help you.